Carphone Warehouse has been sending out refurbished Samsung Galaxy Note 7 units to customers? Carphone Warehouse is sending out refurbished Samsung Galaxy Note 7 units to replaced recalled models? U.K. retailer Carphone Warehouse is apparently sending out refurbished Samsung Galaxy Note 7 units to some of its customers who had purchased a brand new phone when it was launched. A loyal PhoneArena reader has received what he thought was a brand new replacement Galaxy Note 7 from the U.K. retailer. He also received an email stating that Carphone Warehouse received some replacement (emphasis ours) Samsung Galaxy Note 7 units on September 9th and has sent them immediately to stores to be used for customer exchanges. Note that the letter does not say whether the replacements came from Samsung. 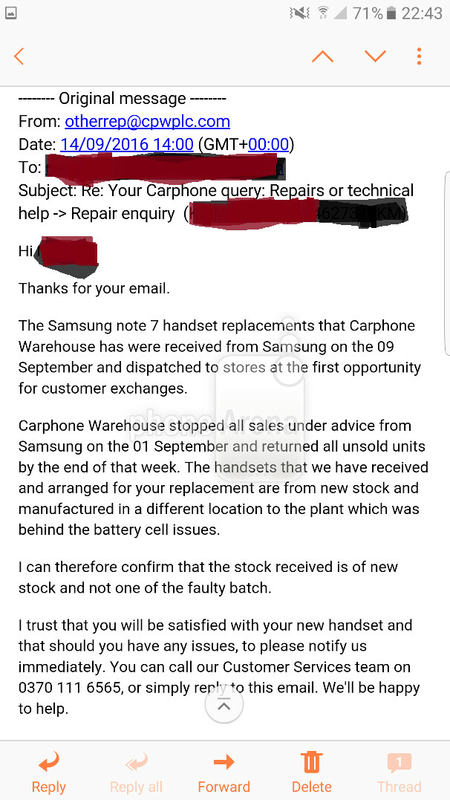 The email says that Carphone Warehouse had stopped selling the Galaxy Note 7 on September 1st, and had returned all inventory of the phone to Samsung by the end of that week. The replacement units that Carphone Warehouse has received are from new stock and were manufactured in a different plant than the one that assembled the Galaxy Note 7 units with the faulty batteries. Carphone Warehouse "can therefore confirm that the stock received is of new stock and not one of the faulty batch." That does not mean that the replacement units it has sent out are not refurbished Galaxy Note 7 units. UPDATE: Carphone Warehouse has issued a statement. "I can confirm that all of Carphone Warehouse's replacement units come from Samsung and are authorized new units as part of Samsung's UK exchange program." Our reader has provided us with the IMEI and serial number of the replacement phone. The serial number starts with RF which indicates a refurbished phone. And Carphone Warehouse did not send the replacement in a new box which is how most refurbished models are received. While many retailers and carriers use refurbished models to replace damaged devices covered by the warranty, it would be strange for enough refurbished models to be available so soon after the launch of the phone. With the unique circumstances of the Galaxy Note 7 in mind here, we hope to get some statements from Carphone Warehouse and Samsung clarifying the matter. This is a shame to see and I hope it hasn't come from Samsung. Kind of getting bored with the Note 7 news now though. Shame, yeah. But heck, the Note7 wasn't even in the hands of consumers for a month, before the battery saga began. So, those refurbs are somehow "new", though not exactly brand new. In which case I would demand a full refund. I would expect a brand new device for peace of mind. Not one that may have checked out and sent back or one that was opened up, swapped out then glued back by Samsung. How can it be refurbished? Note 7 is just launched. They might have replaced only the battery. Which is perfectly fine. Someone is butthurt. When every other story for weeks straight is about this, then it does get a little old. Just like when apple used to change their phones during releases, it would get old with the 5 million stories about it. Or when samsung releases a new phone. Eventually it gets old. Anyway, @phonearena. You wonder why people use ad blockers...... Geez people, either tone it down or expect people to leave. This is getting out of hand. This probably isn't on Samsung. The batteries are Samsung's fault, but if Carphone Warehouse is refurbishing Notes, then they are flat wrong. New is new, and refurbished is used. I can't imagine Samsung sent refurbished units as new Notes to a retailer because that would be game, set, and match for the Note. Note 7 is the phone I want, but not the one I need right now. it's a potential ticking time bomb, so to speak. I wanted a Note 7 until i learned the one available in the U.S. had a Snapdragon. I would probably have gotten it if it came with Exynos considering the S7 Snapdragon vs Exynos battery life difference. Same here, that was my main reason for cancelling my Note 7 order here in Canada. Thought it'll come with Exynos like the S7 did, but it came with the half-baked SD820 this time. After cancelling order, start seeing all this news of it exploding, just very thankful for my decision. If the S8 doesn't come with anything very exciting next year, I'll gladly pick up the international Note 7 at a discount. The phone just came out. It can't be refurbished. PA must think we are stupid. LOLOLOL got owned by Phone Arena itself. Just give up man, you're beloved Note 7 has failed beyond measure. Calling it a failure is an under statement. You got what was coming to you, go ahead man, make fun of isheep and the iPhone, everyone knows you are the lowest of the low and that the Note 7 is the biggest failure of a product launch in recent years. The Surface RT and Microsoft Kin look like successful products compared to the Note 7, hell the Lumia 950 is more successful and LOLOLOL who the heck has a Lumia 950. Maybe you are. From the story: "it would be strange for enough refurbished models to be available so soon after the launch of the phone." Regards, Alan F.
Of course, it wouldn't be so strange if a larger order was immediately turned back in after the phones started exploding. Alan F.
RF doesn't mean refurbished. Mine starts with RF and it was produced the 22nd of August in Vietnam so it is supposed to be battery fail free. They do this with all the phones.I have received twice probably a returned product full with fingerprints on the handsets screen,dust in the box.They are crap.Never buy anything from them anymore.Miss Phones4U.